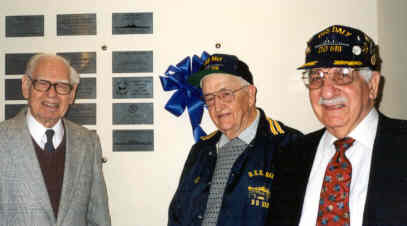 From left, Captain Bradley, Ed Dunn, Chris Grevis, in front of Daly Memorial Plaque (next to blue ribbon) at the Naval Heritage Center in Washington, DC. On March 22, year 2000 at the Naval Heritage Center in Washington, DC, the USS Daly Memorial Plague was dedicated in a ceremony hosted by Admiral McKinney. The Admiral, who spent part of his naval career on a Fletcher Class Destroyer then, introduced Captain Bradley, one of the former “skippers” of the USS Daly during WWII. The highlight of this solemn ceremony was Captain Bradley’s reading of the names of those who lost their lives while serving on the ship. Adrian Schultz accompanied this with the ringing of the ship’s bell for each name. A total of 31 guests attended the ceremony. Nick Lasorsa: Host of the Denver reunion, for supplying a good portion of the necessary funds. Jack Weand & Ed Dunn; Co-hosts of the Philly reunion, for donating the surplus funds from that reunion. Dona Sweeny; Treasurer of the Daly News Fund for supplying the balance. Complete Daly family that made it all possible. From left, Eddie Dunn, Kevin Dunn (son & grandson), Ed Dunn, Anne Dunn, Gerry Maguire, Bill Underwood, Mike Wanamaker, Pat Bradley, Captain Bradley, Adrian Schultz, Kathryn Schultz, Jack Weand, June Yeager and Evelyn Weand. Not pictured, Tiff Graham.